With blueberries at their peak for the next few weeks, we’ve rounded up our favorite blueberry recipes—savory and sweet—to keep this sweet and superhealthy fruit in your menu rotation all week long. Anytime we hear blueberry and cake in the same sentence, we’re in. We’ll be starting the day with this Blueberry Breakfast Cake all summer. This delightful morning variation on bread pudding is assembled the night before you serve it, making it perfect for when you have guests or when you want to present your family with something special on the weekend. Two things we love (besides berries): naan and pizza. 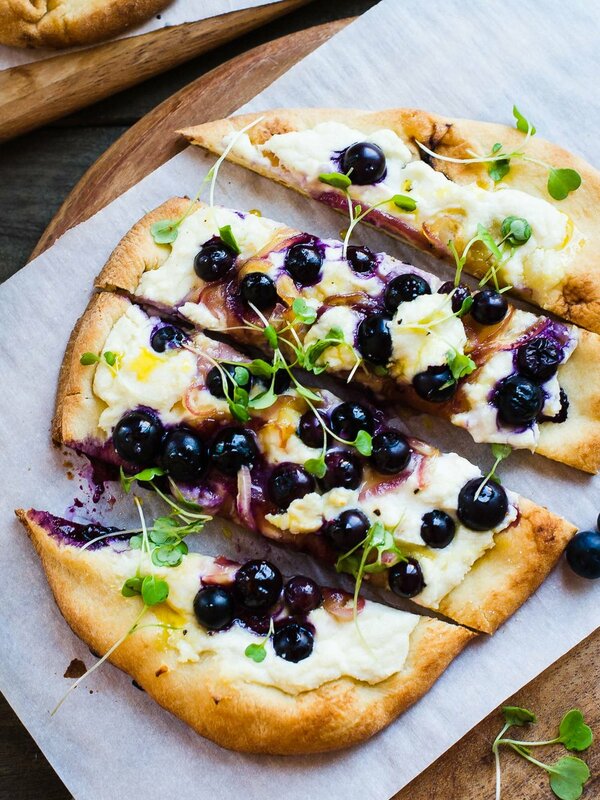 And we love them even more when combined with blueberries into this savory-sweet Blueberry, Feta, and Honey-Caramelized Onion Naan Pizza. Use this Savory Blueberry Sauce to top roasted chicken or pork. Who knew bruschetta could taste this good by swapping out the traditional tomato topping with blueberries? This Scandinavian-style Blueberry Soup is a one-pot wonder that works equally well with fresh or frozen berries, so you can enjoy it all year long. Pull out a few of those fresh strawberries you froze last month and put together this heavenly combo of blueberry and strawberry Cheesecake Bars. Try pairing the zing of ginger with the natural sweetness of cooked berries in this Blueberry Ginger Pie. This Blueberry Pecan Galette looks as impressive as it tastes, but it’s not difficult to make. Whip up the crust up to two days before guests arrive, then mix together the filling and bake. Packed with protein, antioxidants, and tons of flavor, this smoothie is the perfect midday pick-me-up, especially when you’re trying to avoid sugary snacks.